Season chops with salt and pepper. Broil 4 to 5 inches from heat source for 8 to 10 minutes per side. Serve immediately with vegetable medley and cinnamon apples. Vegetable Medley: Steam summer squash and carrots. Toss with your favorite vinaigrette dressing. Cinnamon Apples: Melt butter in heavy skillet over medium-high heat. Saute apple rings until tender, 5-6 minutes. Sprink with brown sugar and cinnamon. Stir gently to blend. 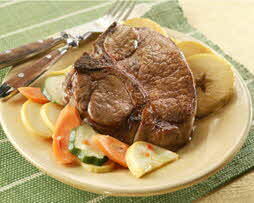 Simply broiled pork chops accompany sautéed apples and a favorite vegetable for a simple but satisfying supper.